This CD of orchestral works was recorded during the 2000 June in Buffalo Festival. Both composers whose works are represented on this recording have a long history and close ties to the festival. The first series of concerts, lectures, and masterclasses, begun by then-SUNY Buffalo faculty member Morton Feldman, occurred in 1975. 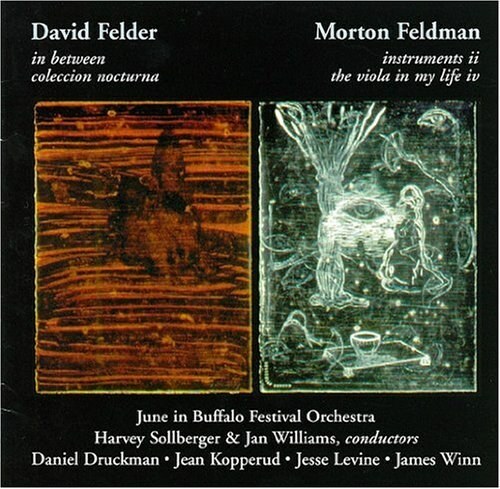 In 1985, David Felder joined the Buffalo faculty and resumed the festival, which was not held from 1980 to 1985. David Felder's music creates and exists in a world with multiple possibilities. The inviting and well-played-out drama of In Between (1999) unfolds through extended timbral gestures, loud, forceful entrances, and, as the piece progresses, increasingly frequent melodic passages. Felder creates varied, rich, dense and beautiful sounds from the orchestra. Although many of the textures are thick and at times are active, busy, and loud, the integrity of the parts is maintained. Felder makes good use of the expanded dynamic range of the orchestra, using its full forces or a pair of instruments in turn. There are a few instances of materials so cliché as to be near-parody. Given the context of the work as a whole -- its overall serious delivery, and the solid construction of the work -- these moments are obtrusive and somewhat perplexing. In Between is scored for four percussionists: three in the orchestra, and a soloist. As the work progresses, the percussion solo part, performed fantastically by Daniel Druckman, becomes more prominent and more traditionally 'soloistic.' Larger gestures are described by the orchestra part. The percussion adds much of the horizontal motion with fast-moving melodic details. Although not disclosed in the liner notes, the concert program mentions that a KAT midi controller is used. Given some of the unique timbres in the orchestra, an uninformed listener may not be aware that some of the sounds in the work are electronic, especially when heard as a recording. Coleccion Nocturna (1983-1984) was completed 15 years before In Between, and features two soloists, clarinetist Jean Kopperud and pianist James Winn. Winn's playing is solid. He executes technically demanding passages with ease, and gives careful attention to detail. However, the piano part is often overshadowed by the more involved and dramatic clarinet solo part. Kopperud's playing on soprano and bass clarinets is powerful. She shapes Felder's inventive melodic lines -- strings of microtonal undulations, repeated attacks, tremolos, wide leaps, extremes in register, and more traditional melodies -- into wonderfully well-shaped phrases. Felder does a brilliant job of weaving solo textures in and out of full orchestra sections. I find that this work makes a more creative use of the orchestra, implementing greater variety in texture, gesture, line lengths, and counterpoint. Morton Feldman's The Viola in My Life IV was written in 1971, shortly after the composer resumed using traditional notation. The orchestral music is sparse, floating, and beautifully colored. Especially in the context of the accompaniment, the viola lines are highly dramatic and wonderfully profound, pure and honest. Viola soloist Jesse Levine performs the work beautifully. Although some may disagree with the use of such a rich vibrato in this particular piece, it is quite tasteful. His phrases are finely shaped and supple, and his tone is gorgeous. Instruments II (1975) omits strings from the orchestra entirely, enriching the ensemble's timbral palette instead with woodwind doublings -- alto flute, English horn, and bass clarinet. Often the focus of the melodic material, chromatic lines are at times passed around the orchestra, sometimes with large changes in register. Feldman, a master of building immense spaces using small sounds, does so wonderfully in this piece. In Feldman's sonic vocabulary, each sound event is carefully constructed so that it dangles loosely suspended from what precedes and what follows. Harvey Sollberger, well known as a composer, conductor, and flutist, leads the orchestra for the Felder works. The Viola in My Live IV and Instruments II are conducted by Feldman's long-time colleague, percussionist and conductor Jan Williams. The level of playing in the orchestra is very high, and the featured soloists are excellent. In Feldman's works, the dynamics alone can present several challenges for the musicians, and I feel that the orchestra is occasionally much louder than the composer probably intended. This CD will be welcomed by Feldman admirers, and will also be much appreciated by those not yet familiar with the works of David Felder. Based on the latest industry listings, this CD seems to contain the only published recordings of each of these four pieces. Recorded at the 25th anniversary of the first June in Buffalo Festival, this is a wonderful collection of skillfully executed, well-written compositions. A much deserved congratulations to the organizers, composers, and performers of the June In Buffalo Festival.